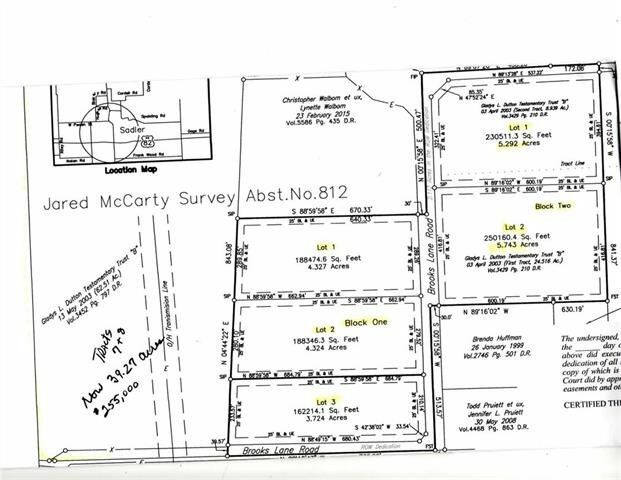 This level acreage is ready for you to build the country home of your dreams. Paved street frontage gives it easy access. There are two large tracts available and 5 lots which are already platted available. This is Block 1, Lot 1. Directions: From Hwy 82 go north on 901 at Sadler. Continue on 901 to Brooks Lane. Turn east on Brooks Lane follow to property. Sign on lots. From 377 go north of Whitesboro to Dixie Road (Don's Barbeque). Go east on Dixie Road to 901. Take 901 north then east on Brooks Lane. Follow Brooks Lane. Signs on lots.